Ellis believes that instead of Kevin Hart stepping down he should have shown people that he has changed and evolved as a person. There have been several controversies surrounding Kevin Hart's appointment as Oscars host, his homophobic tweets resurfacing and his sudden stepping down from the hosting gig. 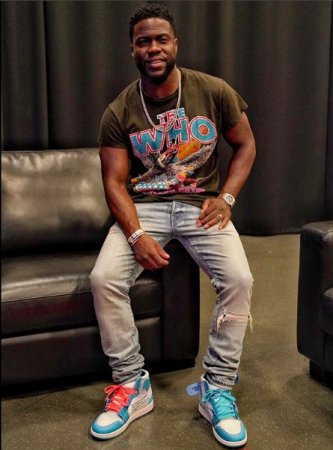 Following this, the President of the Gay And Lesbian Alliance Against Defamation (GLAAD), Sarah Kate Ellis said, "Kevin Hart shouldn't have stepped down; he should have stepped up," Ellis said in a statement released to EW. "Hart's apology to LGBTQ people is an important step forward, but he missed a real opportunity to use his platform and the Oscars stage to build unity and awareness. We would still welcome that conversation with him. The Academy has recently made significant strides in featuring diverse talent onstage and they should now double down on that commitment as they look for a new host." Ellis believes that instead of Kevin Hart stepping down, he should have shown people that he has changed and evolved as a person. The comedian was put on the spot immediately after he was announced as the host of the Academy Awards ceremony in 2019. But the comedian refused to apologise for his controversial tweets claiming that he had already addressed the issue. Hart further went on to say that if he were to lose the gig as a result, so be it. Ellis appeared on CNN's New Day to elaborate on the matter, noting "it wasn't the conclusion I think everybody would've liked." She clarified that she wasn't in "direct contact" with Hart, but spoke with his representatives. "From his actions," she added, it seemed like he wanted to address "this teachable moment" on "his own terms." "We were hoping that this was going to turn into a teachable moment, that Kevin Hart would still be hosting the Oscars and he would be using this moment not only to show his evolution around the LGBTQ community but also to then use the Oscars stage, one of the biggest stages in the world, to help build unity and awareness around the LGBTQ community and how we are marginalized in this country," Ellis said.